The process for obtaining a Labour Market Impact Assessment must change to better reflect the reality of global commerce, according to a Toronto immigration lawyer. employers’ ability to respond to skills shortages in certain industries and regions of the country. “The LMIA process is inherently there to protect the interests of domestic workers, but at the same time, we need to recognize that the way we work is changing, and the nature of competition is global,” she says. According to Lee, her view is supported by the text of the Immigration and Refugee Protection Regulations that govern LMIAs. According to s.203, positive opinions should be issued if the employment of a foreign national “is likely to have a neutral or positive effect on the labour market in Canada,” so long as reasonable efforts have been made to hire or train Canadians or permanent residents. Canadians. The roots of the disconnect can be found in a 2014 overhaul of the system, she adds. positive effect on the domestic labour market,” Lee says. 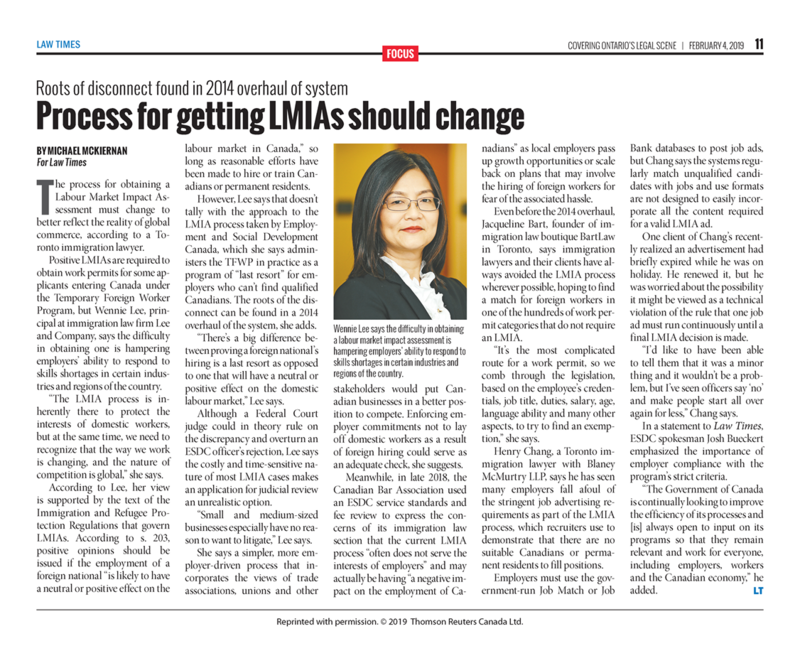 Although a Federal Court judge could in theory rule on the discrepancy and overturn an ESDC officer’s rejection, Lee says the costly and time-sensitive nature of most LMIA cases makes an application for judicial review an unrealistic option. of foreign hiring could serve as an adequate check, she suggests. of its immigration law section that the current LMIA process “often does not serve the interests of employers” and may actually be having “a negative impact on the employment of Canadians” as local employers pass up growth opportunities or scale back on plans that may involve the hiring of foreign workers for fear of the associated hassle. Even before the 2014 overhaul, Jacqueline Bart, founder of immigration law boutique BartLaw in Toronto, says immigration lawyers and their clients have always avoided the LMIA process wherever possible, hoping to find a match for foreign workers in one of the hundreds of work permit categories that do not require an LMIA. “It’s the most complicated route for a work permit, so we comb through the legislation, based on the employee’s credentials, job title, duties, salary, age, language ability and many other aspects, to try to find an exemption,” she says. 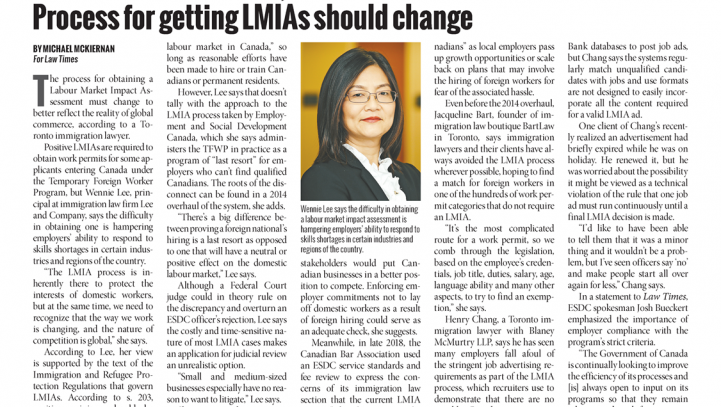 Henry Chang, a Toronto immigration lawyer with Blaney McMurtry LLP, says he has seen many employers fall afoul of the stringent job advertising requirements as part of the LMIA process, which recruiters use to demonstrate that there are no suitable Canadians or permanent residents to fill positions. for a valid LMIA ad. final LMIA decision is made. “I’d like to have been able to tell them that it was a minor thing and it wouldn’t be a problem, but I’ve seen officers say ‘no’ and make people start all over again for less,” Chang says. program’s strict criteria. “The Government of Canada is continually looking to improve the efficiency of its processes and [is] always open to input on its programs so that they remain relevant and work for everyone, including employers, workers and the Canadian economy,” he added.